This article explains the theory of the Service Profit Chain in a practical way. After reading it, you understand the core of this strategy theory. What are the Service Profit Chain? The American economists W. Earl Sasser Jr. and Leonard A. Schlesinger and American businessman James L. Heskett, published their ground-breaking book “The Service Profit Chain – How leading companies link profit and growth to loyalty, satisfaction and value” in 1997, including an explanation of the Service Profit Chain. The basic principle of the Service Profit Chain theory revolves around the fact that customer satisfaction starts with good staffing and treatment of ones own employees. Committed employees are sociable and convey this to the customer. Based on the concept of the service-profit chain, a company should establish a link between employees and customer experience on the one hand and create profit and growth on the other. The different relationships reinforce each other; satisfied customers contribute to employee satisfaction, loyal employees contribute to customer loyalty, and this customer loyalty will eventually result in profit. 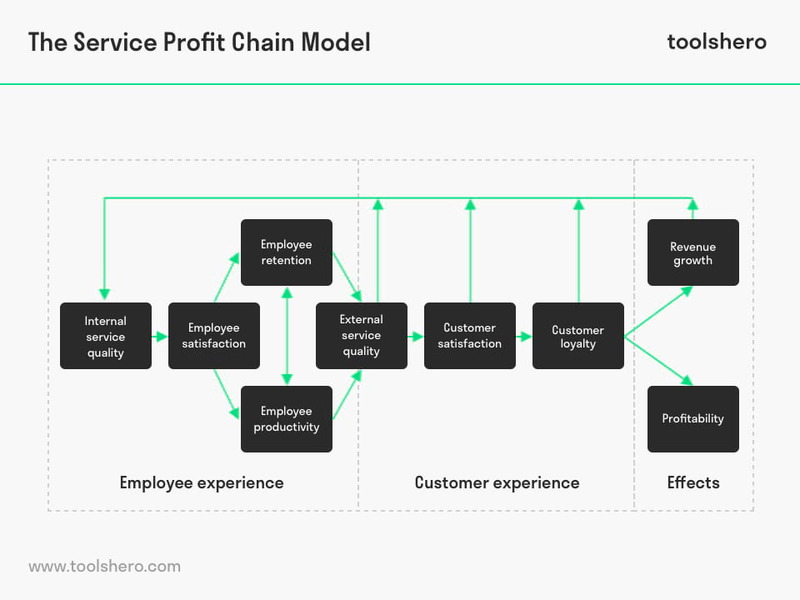 The first few steps of the Service Profit Chain involve employees. An organisation can only be successful if it invests in its own employees. This means that a safe work environment should be created, employees should be involved in the decision making process and should work together in a pleasant atmosphere. A company can achieve this by investing in their employees, to support, train and invest in the development of its employees. All to an extent that hiring, remuneration and development policy are important components of this first step. New employees with the right attitude, can contribute to the internal service quality. By rewarding employees, they are motivated to be actively engaged in the organisation. With training, education and course options, employees are in a better position to be fully committed to a company. The internal service quality will subsequently lead to employee satisfaction. One step cannot be achieved without the other. To satisfy employees and keep them satisfied, the same amount of attention must be devoted to them as is devoted to customers. Engaged employees are more productive, enabling them to provide a better service. They pass on their enthusiasm, leading to a positive image. Their job satisfaction has a positive effect on attracting and retaining customers. This so-called customer value can only be generated by satisfied employees. This results in loyal and productive employees. Committed employees are loyal to their company, department and colleagues. They feel closely involved in the organisation and its joint goal. Therefore, they are more productive and feel very responsible for any end result. In this context, every employee is an ambassador of the organisation and passes this view on to the customers. The deeper need of each individual employee is important in order to make them even more loyal and productive, so they can perform their job with pleasure. The external value proposition for the customer is also referred to as the customer value. Why does a customer choose a specific product or brand or to only do business with a company the customer is already familiar with? Of course, the product or service itself is important, however the customer value is mainly created by the employees of the company in question. They ensure a customer values the way he/she is assisted and addressed. Satisfied employees truly care about the company and are able to convey this to their customers in a good and honest manner. As a result, the service they provide will increase and their attention will be sincere. Customers appreciate this. Step 5 and 6 are related and are directly linked. Customer loyalty is a result of customer satisfaction; a dissatisfied client will not be loyal and will not place a new order. The more satisfied a customer, the greater the chance that the customer will return for repeat business or place larger orders. Satisfied customers are seen as free publicity; they are ambassadors of the company and can recommend products and/or service in their environment with full enthusiasm. A customer is loyal if he/she goes to the same company for a subsequent purchase, irrespective of whether or not the product or service is provided cheaper by a competitor. The customer deliberately chooses to do so and wishes to be helped by the company he/ she is already familiar with and has had positive experiences with. This customer loyalty will subsequently result in more growth and a higher profit for the company. If all customers are assisted well and are provided with the right service, this would be an excellent investment for the future. Customers will continue to return by their own accord. Profit in the Service Profit Chain is not the goal, it is the result. As you can conclude from the previous steps, all additional purchases will ensure that the company will make a profit and grow. Satisfied customers have the strength of word of mouth advertising; they contribute to the positive image of the company. Each step in the Service Profit Chain is a condition that leads to profit. Your own employees are key to customer satisfaction and loyalty. Without the first step, there is no second step and without the second step there is no third step etc. Leadership plays an essential role in this chain. It is the manager’s task to create a culture in which employee’s are optimally facilitated and can flourish. On the other hand, managers are expected to focus on customer service and service provision. Every manager is responsible for being the link between employees and customers and to follow and monitor the entire process. Therefore, managers invest a lot of time in hiring the right employees and will do anything to include them in the decision making process and help them improve. In order to get committed employees, managers must look at everyone’s individual role and encourage and support them in this respect. This way, the service-profit chain will have the potential to succeed. Could you use this theory to benefit your business? Do you recognize the practical explanation or do your have any additions? Do you have any tips or tricks that you want to share about service strategy and execution? Kamakura, W. A., Mittal, V., De Rosa, F., & Mazzon, J. A. (2002). Assessing the service-profit chain. Marketing science, 21(3), 294-317. Sasser, W. E., Schlesinger, L. A., & Heskett, J. L. (1997). Service profit chain. Simon and Schuster. Silvestro, R., & Cross, S. (2000). Applying the service profit chain in a retail environment: Challenging the “satisfaction mirror. International Journal of Service Industry Management, 11(3), 244-268.